MVC / WMP describes a living universe created from and by one singular Entity or Causal Matrix. All physical, mental and supra-mental phenomena are but different aspects of one and the same expression. The four "Chambers of Creation", that is the complementary subjective and objective faculties, are intuitionally significant and at the same time physically relevant. Intuitionally, they are found to form the universal template of conscious experience by defining the conceptual and perceptual arrows of the mind. 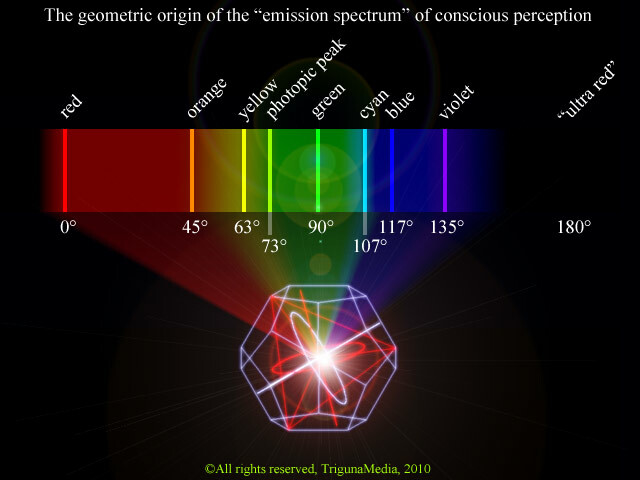 Physically, they constitute complementary states of vacuum and density, both in a quantitative and qualitative sense, activating all types of waves in natural creation. Hence, in MVC / WMP, experience and creation are essentially one and the same phenomenon, and that's why it is a philosophy of life. From the viewpoint of MVC / WMP, without the innate sentiency known as life, the universe would polarize into pure physicality and astrophysical vacuity. It is the waves of life which create equilibrium and shape the universe as we known it. Therefore, waves are not "un-physical" but they are subtle. That is, they have subtle components which elevate their nature and influece beyond the purely mechanical. These subtle aspects of waves can be described not only in psychological terms, but also in physics and mathemathics, leading to solutions in many fields beyond the reach of current science and technology. Clearly, the approach for research on MVC - WMP is not only one of the lab, it is also one of the mind. Only through overcoming the mind's objective bias and dramatically expanding the concept of empiricism, both personally and scientifically, we may develop the intuitional skills to penetrate into the inner, supra-mechanistic secrets of creation and use it to solve a number of problems in modern society in more elegant ways. and geometric cause of spherical compression. C ube-octa distributive stellation wave matrix, with implied tetra stellation highlighted. This is the secondary singularity and geometric cause of rotational compression. Impression of phasic rotation in one plane of the cube-octa wave matrix. and transformations, relating to the long range forces of nature as accelerative principles. geodesic path is evolved by iteratively adding the spherical and rotational compression tensors. as a result of the objective bias. account for the "primary objective" in the MVC / WMP creation diagram? "VIRGOHI21 is an extended region of neutral hydrogen (HI) in the Virgo cluster discovered in 2005.
plus a brief discussion of actual applications in the field electro-physiology. 1. 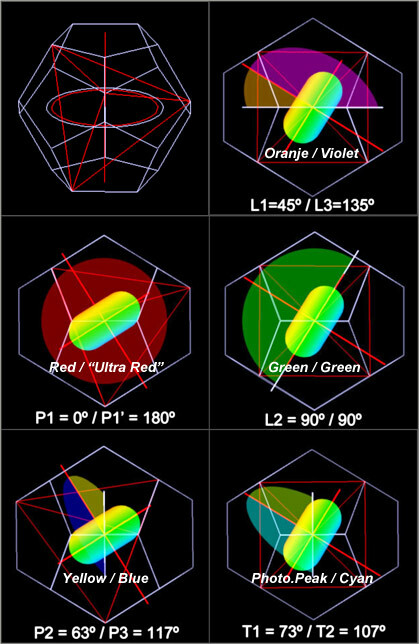 "The geometric origin of selective colour empathy"
2. "The geometric origin of selective sound perception"
which could be verified using speech synthesis software, producing the vowels. Below images show the toroidal resonance patterns and the resulting formant table. them follows in the main article in JOURNAL OF FUTURE STUDIES (due May 2011). Tthe complete cycle of the MVC / WMP main diagram among the subjective and objective faculties makes psychologically sense. The reduction / objectivation phases (not drawn here) indicate that the true source of inspiration is actual synergy / empathy and not mere objective intentions and longings. At the same time, the only cause of individual intentions and longings can be a subjective feeling of self-awareness, and not cognition in the objective sense. Electro-physiology involves the measuring and interpretation of physiological data, in most cases ECG and EEG spectra. The synergetic and cognitive matrix singularities are part of the Causal Matrix, so their waves are causal waves (or, popularly, waves of "consciousness"). These can normally not be measured directly. However in the case of the heart and brain, as these are highly evolved, sensitive organs which relate to the body as well as the mind, their inner working is directly translated into physical signals, that is, electricity. This means, and was mathematically proven, that Golden Mean ratio wave recurrence in heterodyne synthesis directly relates to fractal wave patterns in additive synthesis. Likewise, octave ratio recurrence in heterodyne synthesis relates to periodic signals in additive synthesis. For example, in the case of periodic signals, this obviously relates to the heartbeat which, because it is (normal) additive synthesis, can be measured directly. 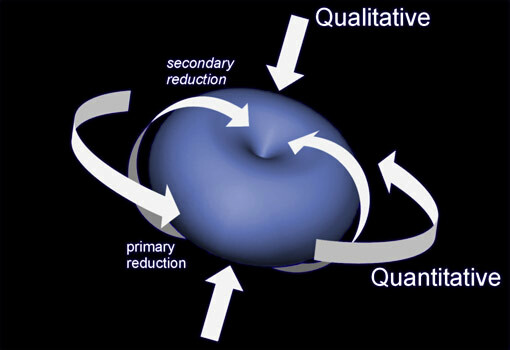 Fractality is also additive synthesis, and relates to the heart rate fluctuations (HRV). Heterodyne wave synthesis is normally not directly measurable, however in the very exceptional case of the brain, it is. This is because it was discovered that the brain, as a consequence of its network structure, translates heterodyne waves into a dierctly measurable spectrum. This means, that at moments the brain is in a highly coherent state, either or both of the wave matrix singularities can directly be measured as Golden Mean or octave series. This way it is shown that "heart- and brain intelligence" are locked in an intelligent, closed-loop equilibrium, where "being one with yourself" and "being one with others" are equally important, but have a different meaning for the heart or the brain. 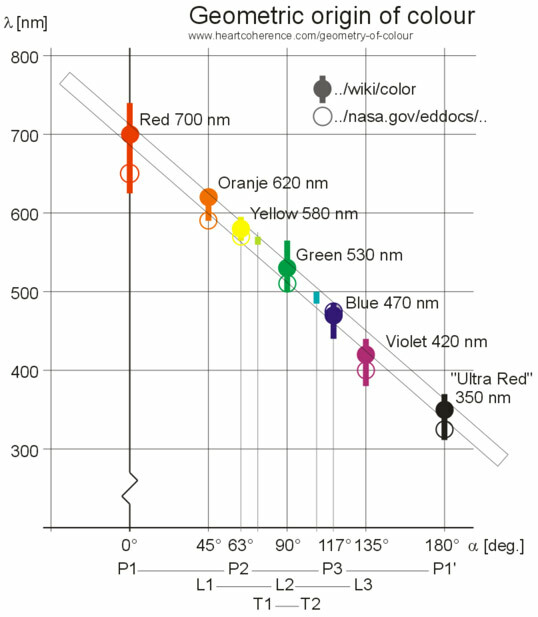 This insight is the unique spin-off from MVC / WMP in the field of electro-physiology. A additional special lesson to be learned is, that discriminating between "feeling" and "thinking" is not equivalent to discriminating between "heart" and "brain", respectively! The brain also "feels" (that is: synergy) whereas the heart also "thinks" (that is: focused passion, which is not the same as longing..!). Wave Matrix Physics for heart and brain diagnosis and training is used by medical professionals and therapists worldwide, using the CardioGem and NeuroGem (sensors, monitor and software from trigunamedia.com). Below are samples from sessions showing low, respectively high coherence in heart and brain. The wave matrix singularities were added for clarification. 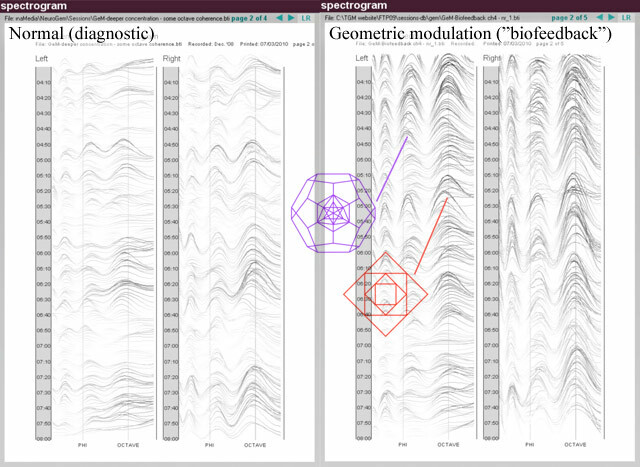 NeuroGem spectrograms from respectively a diagnostic and a training sesssion. The spectrogram shows the amount of coherence for all geometric ratio's in the full EEG spectrum apprx. between 1.4 and 2.2 and is updated every second. The training session shows dramatically improved coherence accurately at octave (2) ratio and around Golden Mean (1.62), as result of biofeedback. Sustained coherence, seen as a trail of peaks, is almost exclusively occurring at these ratio's and is therefore associated with cognitive clarity (octave) and empathy (Golden Mean). CardioGem history graphs with Internal Cardiac Coherence (ICC, blue) and tachogram (red). The ICC level indicates the (momentary) amount of coherence in the ECG spectrum (i.e. octave related). The tacho ideally implies fractal coherence (i.e. Golden Mean related) in the Heart Rate Variability (HRV) spectrum. In this recording, as result of monotonic = unnatural breathing, the internal cardiac coherence is low, and the HRV coherence is virtually zero. CardioGem ICC and tacho history plus ICC histogram and Dynamic Index. This recording is from a healthy mid-aged subject with good ICC and HRV. HRV coherence (also called Harmonic Inclusiveness) is not analyzed directly, but is derived from the ICC statistics. 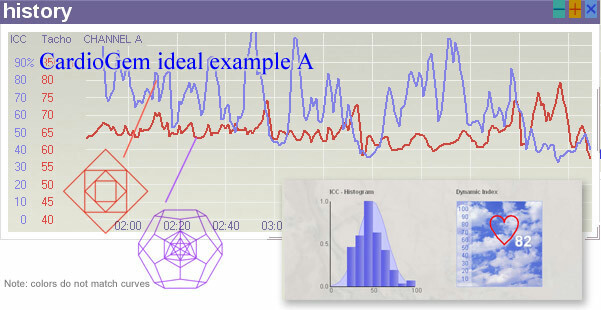 The ICC histogram ideally follows the Gaussian (natural) distribution (shown on the background) which is a measure for ICC and HRV coherence together. The quality of the natural distribution is captured by the CardioGem's Dynamic Index indicating allover cardiac coherence (that is, ICC plus HRV at the same time), and thus health.